Still standing in a sea of coreopsis and sunlight, I use my smart phone to pull up my Facebook account and plug in the daughter’s name. Glancing at her photo, she looks happy, not someone who is estranged from her mother, years and years of estrangement to the point of no one knowing where she is in the world. I try not to dwell too much on the photo. After all, I’m on a mission. But, my imagination and the tragedy of this situation tug at the edges of my mind. I imagine what may have broken their relationship to such extremes. Imagine a daughter, who is coming of age but still immature. Imagine she wants to be free of her mother’s supervision. Imagine a mother, worried her daughter might make mistakes, so she holds tighter and tighter while the daughter struggles harder and harder to be free. Imagine the mother, in desperation, becomes more controlling. Imagine the daughter does make mistakes and the mother can’t resist an “I told you so.” Imagine the daughter runs away, severs the relationship forever. There are probably a hundred more scenarios I can imagine. But, back to my mission. Right now I have to write a simple message. Not much information, one line should do it. I imagine how strange it will be for this daughter to receive my message, a message from a complete stranger in another state, asking her to call another complete stranger in yet another state who is a friend of her mother. I look at the picture again. She looks intelligent. She’ll read between the lines. But, will she care? Will she call? As I stand in my sea of flowers poking one letter at a time on the small screen of my phone, it occurs to me how strange and even wonderful it is that within minutes this daughter is found (hopefully it’s the daughter), my friend and I have communicated across thousands of miles and I am now sending a message to this woman. Life is strangely wonderful and at the same time, often cruel and unjust. There is a certain poignancy to this unfolding story. After texting “Done” to my friend, I continue working and wondering if the daughter will call. How hard it must be for my friend to deliver such sad news, not knowing how it will be received. Or, if it will be received, waiting to see if the daughter ever calls at all. And, how tragic for this family torn apart for whatever reason to hear the news of a mother’s death, having no way now of making amends, if there is any regret. Within minutes, my friend sends another text announcing the daughter’s call to her. The daughter jumped right on it. She cared. Although I never met my friend’s friend or her daughter, I say a little prayer for these two women. They have unexpectedly touched my life, reminding me of what is important in my little world. I pray for inner peace and self-forgiveness for the daughter. I hope the mother’s spirit is at rest. Surely, there were times when each wanted to reach out to the other, to close the gap of silence, to speak and forgive. And, I say a prayer for my friend, for taking on the role of family and caring. As for me, my heart is heavy yet at the same time, very light. I smile at the sunny day and the sea of coreopsis at my feet. Somehow, I feel like I played a larger role in the universe today. Life is, indeed, strange. Many times during my 64 years I too was guilty of the sin of estrangement from my parents. I have a box of letters of angst from my late mother to prove it. I will have to write a short story on the topic. I was the unfilial daughter, the rebel of the family. When I finally learned to quiet the emotional tornado, turn it around and finally find a way to make the parents proud, life became peaceful and happier for all. Enjoy your posts…you are an inspiration, Kathy. 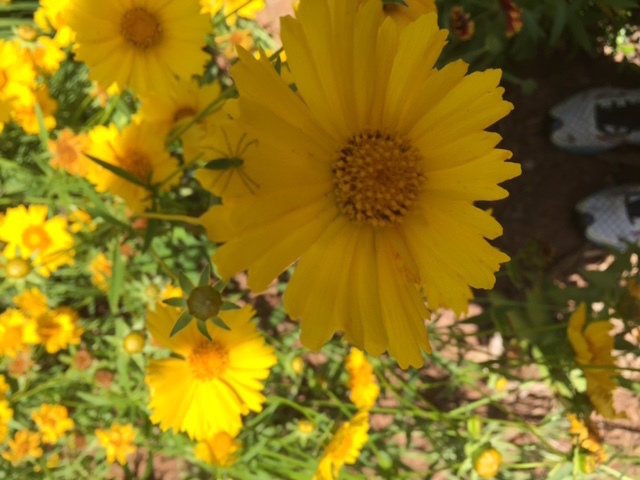 Wonderful story Kathy, I will never see the Coreopsis in my back yard in the same way. What an amazing world we live in. I also found an estranged daughter for someone in my husband’s family through Facebook, not to report a death but to tell her of some money coming her way. Without Facebook, we probably wouldn’t have been able to find her. Good for you to help out… all without leaving your beautiful flower garden! This was beautifully expressed. I know you have an artistic bent, but don’t know if that includes creative writing — I feel as though there is a short story lurking here, just begging to be given form. Love this post. Isn’t it strange how many people of a “certain age” don’t use social media. Imagine if the woman who passed away had reached out via Facebook to her daughter. What if her daughter had found a post on her Mom’s facebook page saying how sorry she was to not have her daughter in her life. I would say that “life is good”! Technology can certainly broaden our influence in the world, and what a wonderful “good deed” you were able to provide with such minimal effort, yet life changing for the daughter. I just came across your blog. But thx for sharing this story Kathy. Really enjoyed this post, your perspective on retirement and life in general is very refreshing will make sure to keep checking the blog!